You may get a F22 message on the boiler from time to time, when this happens you will have no heating or hot water. 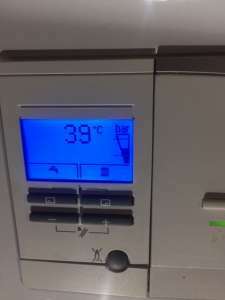 This is not usually a boiler fault but is because the central heating system (radiators, valves and pipework) have lost some pressure (water). It is nothing to be concerned about unless it happens regularly. Many systems will need “topping up” 3 or 4 times a year. Adding pressure is very simple and is a task most home owners are happy to do. Please follow these steps if you feel confident. First check around the central heating system and boiler for signs of leaks, if none are present then proceed. TIP: if you press any of the 4 buttons under the screen it will light up blue for a while to make it easier to see. Somewhere on the system, most likely under the boiler you will find a filling loop. 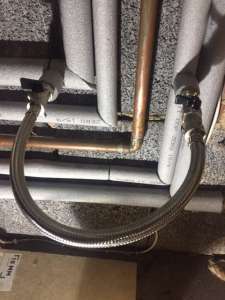 It is a flexible silver pipe connecting 2 pipes together with a valve on either end, usually each valve will have a black plastic lever (If the loop only has 1 valve you follow the next step). Please turn the lever on the right, it will only turn 1 way, it will turn ¼ turn then it will stop. Now slowly turn the valve on the left, you will hear a hissing sound of the water and pressure being added to the system. Please do this slowly and keep an eye on the screen because its important not to put to much pressure in. You will see the pressure going up on the screen, once there is the minimum pressure the display will change. A number will appear in the centre of the screen, this number is not important, on the right hand side you will see a graphic with bar on top. Part of this graphic is filled in, you will see a dotted line towards the bottom and the same near the top, continue adding pressure until you are around 1/3 full. PLEASE DON’T FILL ALL THE WAY TO THE TOP. All that remains to do is to turn the valves back to the position they stated in (across the pipe). 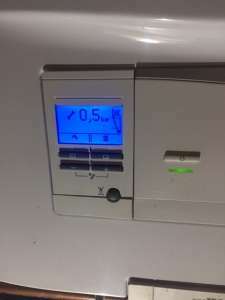 The heating and hot water will now work normally. Why does this happen and can it be a fault with the boiler? The boiler has a pressure sensor, this is to ensure the boiler doesn’t fire if there is no water within it which would damage the boiler. 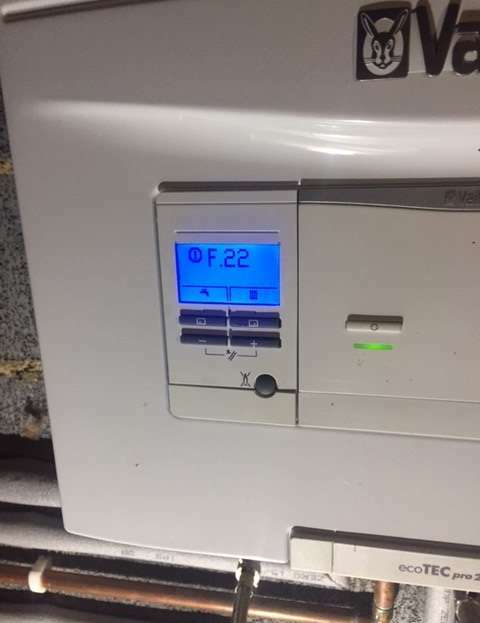 When water (pressure) is lost from the central heating system or the boiler the F22 is triggered. It can be a boiler fault, (the boiler is leaking) or in an older boiler it maybe that the expansion vessel has failed. On a new boiler it is most likely caused by a leak on the central heating system. If you have to top the system up every few days or even once a week the leak really should be found and repaired. If you ignore and keep adding pressure you will lose all of the inhibitor within the radiators which will then cause sludge to build up, this can be damaging to the boiler. Also the leak could cause damage to your property.